Set in the upper level of the grand colonial mansion at Gregory’s Road, the popular Italian Restaurant ‘The Bay Leaf, launched the ‘Silver Room’ for private dining last week. ‘Silver Room’ is an exclusive dining room for special celebrations or a quiet family. It exudes an elegant ambiance maintaining the Italian theme with a painting of a Tuscan landscape, a large mirror reflecting the candlelight , theme music , personalized service, a menu with Italian Seafood, Pasta and meat specials and a fine wine list. Main course offers Filetto Di Salmone con Panzanella – Seared Atlantic salmon fillet served on a bed of onion, roasted bell pepper, olives, croutons and King Prawns, finished in a fresh tomato and basil sauce to Agnello di Bosco -Australian herb crusted baby lamb chop, mint pesto, balsamic syrup and a vegetable Risotto cake among a refined choice of steaks and seafood dishes being served along with the main restaurant menu. Bayleaf offers three of other Private dining rooms ideal for small corporate luncheon meetings, special corporate presentations or memorable family events. 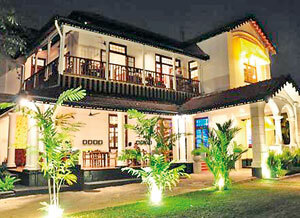 The party can dine in one of the city’s exclusive colonial mansions and enjoy Chef Saroj’ Italian specials. The food, from steaks to seafood to fresh pasta, is a standout and the dessert range is outsatnding. For more details contact 2695920.